We’d love your help. 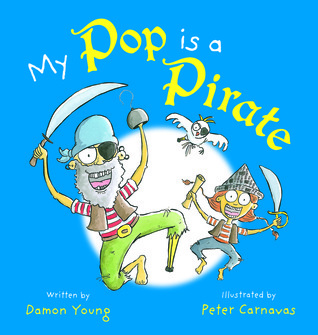 Let us know what’s wrong with this preview of My Pop is a Pirate by Damon Young. Some pops scream ‘Huzzah!’ when they dive in dazzling pools. But my pop is a pirate … he yells ‘Aaarrrgghhh!’ and buries jewels. All pops are different. But what if your pop was really different? What if yo On the heels of the popular My Nanna is a Ninja comes the second picture book from a talented author and illustrator duo this time celebrating our much-loved grandfathers. All pops are different. But what if your pop was really different? What if your pop was a … pirate? To ask other readers questions about My Pop is a Pirate, please sign up. Written and illustrated by the same team that did My Nanna is a Ninja; this is a companion volume with Grandfathers as the focus. It has the same sense of inclusiveness, showing grandfathers or Pops, as they are called, of different types. It has the same light-hearted sense of fun as it looks at how people are different. The cover is colourful and eye catching and the illustrations are clever and fun. I particularly like the pop in green gloves chopping wood but there were plenty of other fun i Written and illustrated by the same team that did My Nanna is a Ninja; this is a companion volume with Grandfathers as the focus. It has the same sense of inclusiveness, showing grandfathers or Pops, as they are called, of different types. It has the same light-hearted sense of fun as it looks at how people are different. The cover is colourful and eye catching and the illustrations are clever and fun. I particularly like the pop in green gloves chopping wood but there were plenty of other fun illustrations that perfectly match the playful rhyming text. Another favourite was the pirate pop steering his ship on ‘sharky seas’ and I like the pop racing rally cars. Review coming. Another cute and funny book in the series. Think these are going to be firm favourites. I'm a philosopher and writer. I'm the author of several popular nonfiction books, published in Australia and overseas in English and translation. My books include Distraction (2008), Philosophy in the Garden (2013), How to Think About Exercise (2014) and The Art of Reading (2016). I've written for outlets including The Age, The Australian, The Guardian, the ABC and BBC, and I'm a regular radio gues I'm a philosopher and writer. I'm the author of several popular nonfiction books, published in Australia and overseas in English and translation. My books include Distraction (2008), Philosophy in the Garden (2013), How to Think About Exercise (2014) and The Art of Reading (2016). I've written for outlets including The Age, The Australian, The Guardian, the ABC and BBC, and I'm a regular radio guest. I have also published poetry, short fiction and three children’s picture books: My Nanna is a Ninja (2014), My Pop is a Pirate (2015) and My Sister is a Superhero (2016).